What on earth is going on with our mail just now?! 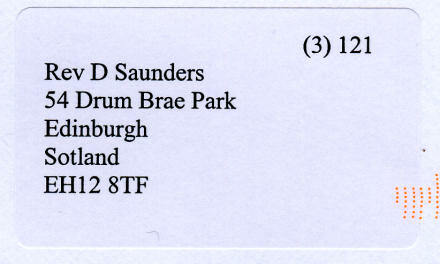 First, it appears that Jane has been inadvertently ordained as we’ve started receiving mail addressed to “Rev Jane Saunders”. Next, it would appear that whoever sent this envelope had no idea which town I live in. Or which case to use: UPPERCASE or lowercase? What the heck, let’s use BOTH! Since when was Cellardyke in Stirling? Since when was Stirling in Edinburgh?! 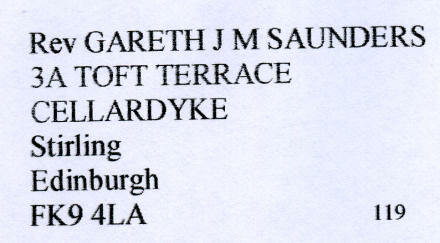 And although I know that Stirling does have a Falkirk postcode (FK9) it does amuse me that the list of related towns on that address label is Cellardyke, Stirling, Edinburgh, Falkirk. And who and where was this letter addressed to? 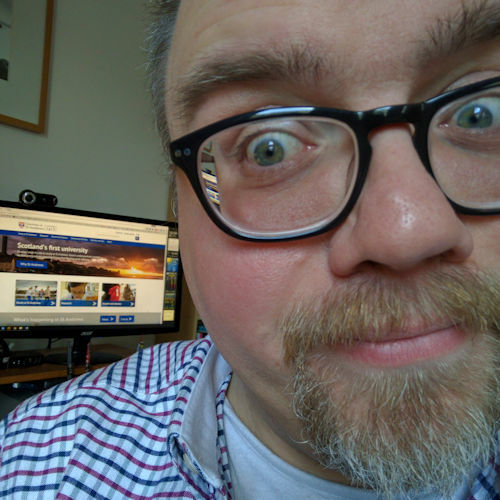 Who is “Rev D Saunders” — clearly a misreading of “Revd Saunders” (which is wrong anyway, as everyone knows that should be “The Revd Mr Saunders”). FK9 4LA takes me to the University of Stirling campus!! But who actually sent it and was it worth the long journey round Sotland? Previous Previous post: Who is this aimed at? !